At around about 11am yesterday morning, you may have been driving down Malvern Rd in Prahran and passed a girl with red hair outside of a newsagent jumping up and down with excitement, hugging her fiance and quite possibly saying rather loudly oh my god I'm in a magazine! I'm in a magazine! I'm. In. A. Maga-zeeene! 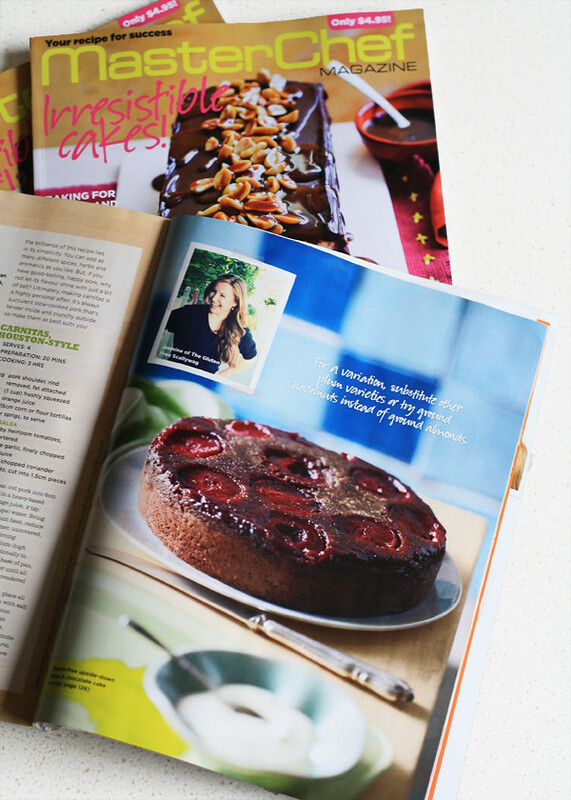 Well, that was me, because I've been featured(my recipe that is) in the April issue of Masterchef magazine!!! Yooooooo! I was surprised a few months ago to receive an email in my inbox requesting a recipe for the April feature that showcased six food bloggers from around the world. After my dance outside the newsagents (and then inside after downloading a copy to the iPad ) I was humbled to be featured along side such great company, some local, some not, but all, equally tasty. Hello to the bloggers who were also a part of this feature - Joy of Joy the Baker , Lisa of Homesick Texan , Giao of Kiss My Spatula, Charlotte of How to Shuck and Oyster & the lovely Peter of Souvlaki for the Soul - a virtual hug and happy dance to you all! So, yes, yesterday was a bit of a blur, between buying the Malvern Rd newsagents out of the new issue, my Mum also buying the only copy of the issue at the local Margaret River Newsagents (ha!) oh, if you've read the feature and are here for the first time - helloooo! - Also, if everyone could please take a moment to say a virtual hi tomy Nan whom inspired the recipe in the feature - Gluten Free Upside-Down Plum & Chocolate Cake - love you Nan! 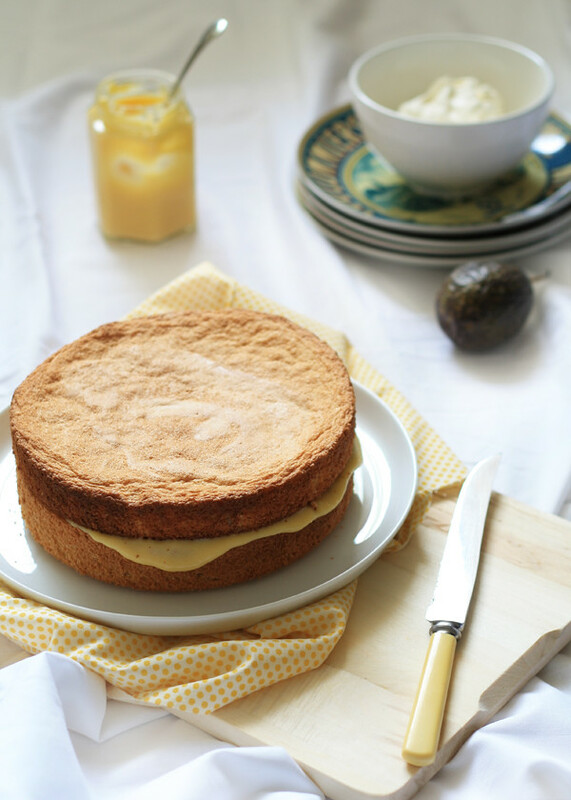 Amongst all the happy dances there was visits from the future in-laws and I spent a few moments in the kitchen to whip up some luscious lemon and passionfruit curd and a sponge cake to sandwich it between. It was a birthday cake in fact, for my gorgeous fiance (who also took my photo for the feature - thank you - Masterchef took the food photos). Yes, I could only make a lemon and passionfruit cake, two ingredients I'm really not that fond of, for him. 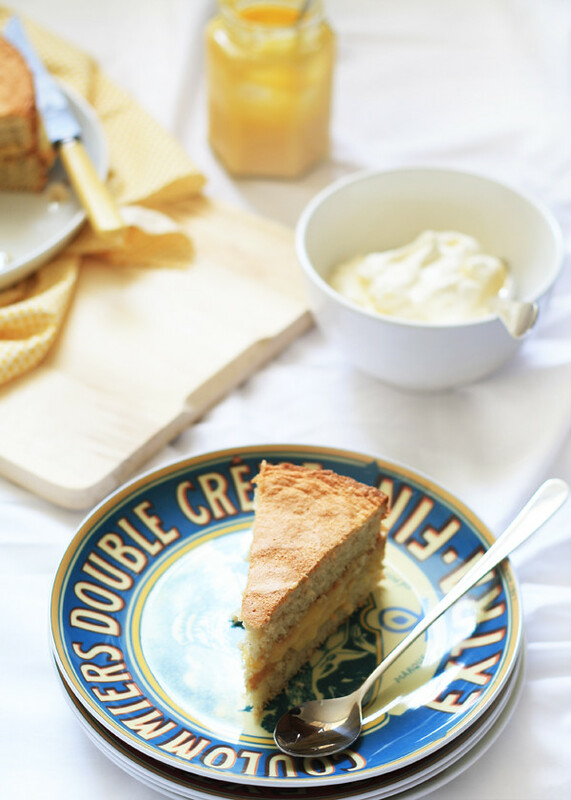 So, have a piece of light as air sponge with lashings of tart lemon curd - oh and for me, have that big dollop of cream with it to celebrate a birthday and my first feature! *happy dance optional, but really handy in working off the big dollop of cream* Or.... if you're like me and don't like passionfruit and lemon then make yourself a chocolate cake instead - tee hee hee! In a medium bowl, whisk together the eggs, yolks and sugar until frothy. Pour into a heavy based small saucepan over medium heat and whisk in the juices and zest until everything is combined. Ensure the sugars are dissolved and then gradually add the cubed butter one piece at a time, whisking all the while til melted and repeat with the remaining butter cubes. Once all the butter is melted and combined, reduce the heat and cook for 3-4minutes until the curd is just bubbling, stirring all the while with a spoon and it's created a lovely thick layer on the back of your spoon. Remove from heat and pass the curd through a sieve to remove the passionfruit seeds and lemon zest, creating a luscious, smooth curd. Pour into a sterilised jar. Refrigerate until set (min 3-4hours). In a large clean, dry bowl whisk the eggs on high until light and frothy, this takes about 6minutes in my beloved KitchenAid. Whilst the eggs are frothing up, sieve together the flours and baking powder three times. With the mixer still running on high, add the castor sugar a spoonful at a time to the eggs, ensuring the sugar is fully incorporated before adding the next. Sift the flours over the egg mixture and fold in until fully incorporated. Spoon into cake tins, carefully level the batter out with a light hand so as not to remove the air in the batter. Bake for 13-15minutes until just gold brown. - Do Not tap the tin before baking. You WANT those air bubbles. - I used a fan forced oven at 180degrees. If you have a conventional oven you may want to increase the heat by 5-10degrees. - Ovens are finicky, bake in the middle of the middle shelf. If it looks done before 15minutes then take it out. I have had feedback that it may need a little less cooking time in other bakers ovens, so please, always use your baking commonsense. If your oven cooks things fast, then allow for this and take it out around the 13minute mark. -Allow to cool in the tin, as I find they loose their air if you turn them out whilst too hot. Run a knife around the edge to loosen it before turning onto a wire rack. - Sponges are delicate, so be careful. I've a friend whose a fabulous baker and she still hasn't got a perfect sponge out of her oven yet. They're quick to bake once you get the hang of it. Allow to cool in tins. Run a blunt knife around the edge of the tin and flip the cooled sponge onto your serving dish, removing the baking paper from the top. Dollop half a cup of curd (or so) onto the sponge and spread out to the edges (it's always good if it squishes out a little!). Remove the second sponge from the tin and carefully place on top, remembering to remove the baking paper. Serve on the day the sponge is made. 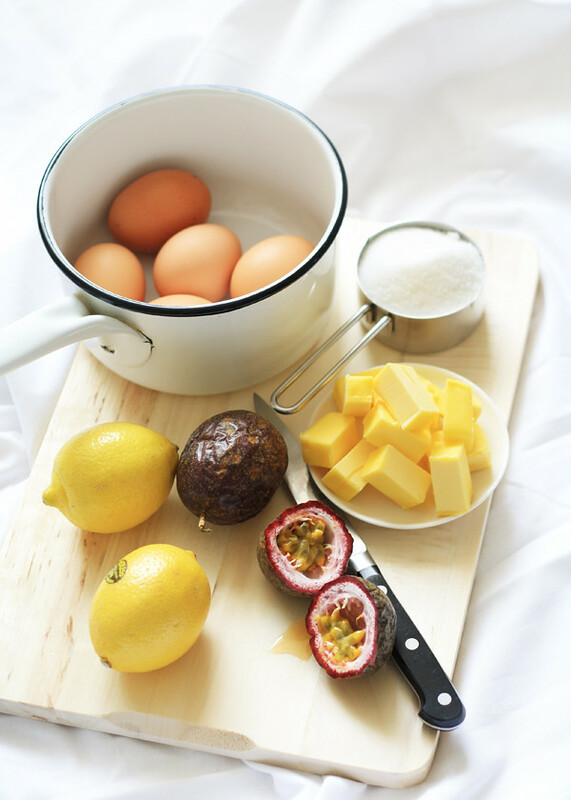 Be really decadent and top with the remaining curd spread on top and the delicious juices of another passionfruit. Or just a little dusting of gluten free icing sugar is just as good. Oh and don't forget the big dollop of cream!